I planted a large determinate crop of Roma tomatoes with the intent of canning my own organic and HFCS-free ketchup, salsa, tomato sauce and whole peeled tomatoes for this coming year. Unfortunately, I lost most of my crop to late season blight. 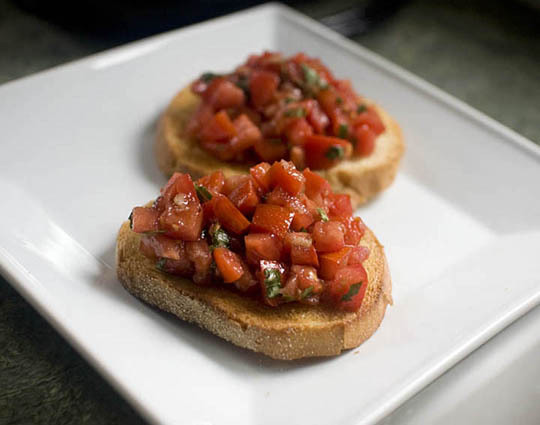 I have been able to salvage a couple of plants, and one of the ways I’ve been enjoying my limited harvest is in this delicious bruschetta recipe. 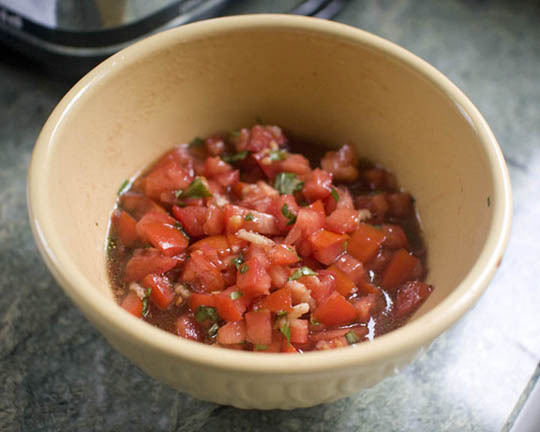 Stir together the tomatoes, olive oil, vinegar, basil, and 1 pressed garlic clove. Season with salt (I like sea salt) and pepper. It’s ready to use now, but I like to chill it a bit for the cold topping/warm bread contrast. Brush the bread with olive oil, then toast it and rub on one side with the remaining garlic clove. Top each slice with some of the tomato mixture and serve immediately. This is also delicious with a little grated parmesan or feta and black olives mixed in, or topped with mozzarella, then broiled. This recipe is very similar to this authentic one, which I learned in a cooking class I took in Bellagio. Looks nummy! I have a pretty big tomato crop I need to use up, so I’ll add this to my recipe list. What recipe do you use for ketchup? I haven’t actually made ketchup before, but I was going to use a recipe from a canning book I have called, “Putting Food By”. Hello Sage! This looks so delicious…and simple!! We had only one tomato plant this year (a cherry) which we use for salads but that hasn’t stopped me. When we go down to San Diego to visit my dad (two or three times per month) we always buy fresh vegetables from a family owned farm stand on the way. You can see the large garden where they grow all kinds of goodies. This year their tomato crop is going wild so we have been able to buy delicious, organic tomatoes at amazing prices. Such a Frugal Luxury! Yesterday I stocked-up and plan to freeze a few dozen of them (whole-unblanched) and use them for tomato based recipes this winter. Thus, when a recipe calls for a can of tomatoes, I take from the freezer 2 or 3 of the frozen, and let them soak in a bowl of water for about minutes while I work on something else. I use my fingers to gently peel off the skin (right in the soaking water). The tomatoes are still slightly frozen, so I allow them to thaw just enough so they’re easy to dice. Then they’re popped right into the soup/marinara/chile’ pot as is (juices included). The difference they make in the final product is amazing.